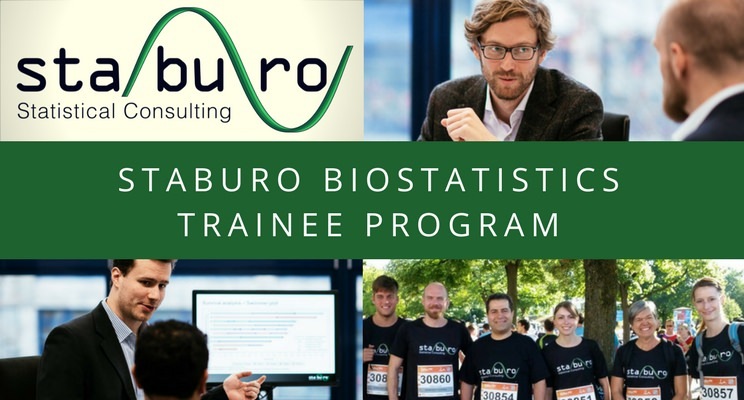 We created the first specialized biostatistics trainee program in Germany (maybe even Europe- or worldwide) in order to continue to build a strong and sustainable team at Staburo. The 12-month program is perfectly suited for very talented Master’s or PhD graduates. Applicants preferably have a (bio)statistics background, with programming expertise and great interpersonal skills. At Staburo, the trainees will take part in a structured, established training program (e.g., training in statistics for oncology trials, SAS programming environment, crossover correction in oncology, PK analyses, CDISC, general clinical study management, etc). Learning sessions will be combined with on-the-job training of all important biostatistician tasks within clinical research [e.g., clinical trial planning (phases I-IV), input to SAP, randomisation (including emergency envelope production) statistical programming with SDTM and ADaM (SAS, R), sample size calculation, validation (e.g., SAS: source code review, double programming), PK analysis, survival analysis, preparation/input to HTA appraisals (e.g. NICE and IQWiG), presentations and statistics workshops, data transparency (ClinicalTrials.gov, EudraCT), bayesian methods (e.g. BLRM for dose escalation, safety evaluation), translational medicine – biomarker identification, input to report]. The Staburo biostatistics trainee program also includes attending clinical statistics conferences, visits of clients and regular meetings with a dedicated mentor and managing directors. Trainees will attend all internal Staburo events & meetings and relevant external trainings. After successfully finishing the program, the trainees will be offered the chance to further develop their biostatistics skills in clinical research in our company. The goal is to develop trainee program graduates to senior and – in the long term – principal biostatisticians at Staburo, with more project responsibilities, unique skills and excellent client interaction. If your require more information or want to apply at Staburo, please write us an email to bewerbung@staburo.de.